Today there were some more somber parts. We started by going to Pegasus Bridge, which was the first target to be recaptured from the Germans at the beginning of D-Day. The Allies were successful. The pilots of these gliders had to crash land deliberately and then go on to fight. "Every landing was a genuine do-or-die situation for glider pilots. It was their awesome responsibility to repeatedly risk their lives by landing heavily laden aircraft containing combat soldiers and equipment in unfamiliar fields, ... often in total darkness." The memorial flags at Juno Beach -- the beach where the Canadians landed. One of the remaining fortified bunkers built by the Germans as they watched for the approach of the Allies. Since all the ports were heavily occupied by the Germans, the Allies built a port at Arromanches, where they could bring in ships with soldiers and supplies. It was pre-fabricated and transported from England! Some of the concrete structures that were part of the port can still be seen. To give you some perspective, they structures are about 1 mile out to sea. They were huge (about 6 stories high). Here, you can witness the formation of a brand new bunker! 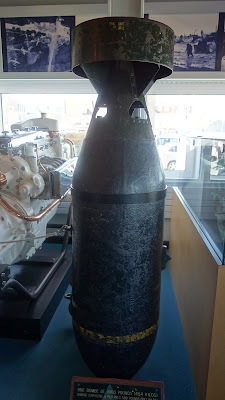 This huge bomb is one of the 10,000 dropped during the first attack. Omaha Beach, where the Americans landed. Later we travelled to Colleville-sur-Mer to visit the famous American War Cemetery, overlooking Omaha Beach. After the war, the land was given to the Americans by the French Government, so these American soldiers are buried in American soil. It was heart-breaking to see so many unidentified soldiers. Sad to think that we never learn -- wars are still happening. No-one wins a war. Thank goodness for the leisurely drive to Bayeux at the end of the day.